Now the complicated part. I went to San Francisco sometime October 2010, to help Myrna campaign for a council seat position. In Hercules, the mayor is appointed by council members through votes. Myrna told me if she wins a council seat and tops it, she will be appointed Mayor in 2012. Council members take turns being mayor every year. The good news is my sister won a seat in the council but didn’t get the top spot. She was linked to the old administration which had issues with the citizenry. Winning the second spot would make her by tradition the mayor by 2014. I thought no big deal. By a twist of fate, the appointed mayor resigned before he could be charged with impropriety, which then made the seat vacant for mayor. Another appointment for mayor was done on January 28. 2011. 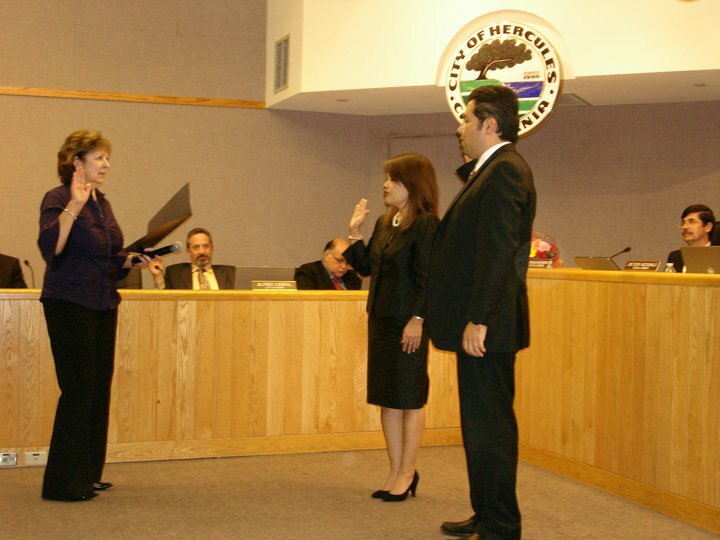 Myrna was then appointed the Vice-Mayor of the city of Hercules. The citizens in Hercules were not happy with the old council members and demanded a recall or another election. So yesterday night, there were three new council members and voting for the new mayor of 2011. They voted for my sister, Myrna as the new mayor, just barely a year after her election to the city council last November 2010. Myrrna Lardizabal de Vera named 1st ever Pinay mayor of Hercules, CA for 2011; she is the 5th Pinoy to be elected mayor in Hercules. My sister , Lorna Lardizabal-Dietz curated the controversy of one Council Member’s seat. If you read the links, you will see the history of why the Recall Movement started in the first place.